Condominio nuevo, moderno, con una vista increíble del océano y la hermosa Cartagena. Disfrute de las hermosas puestas de sol, el sonido de las olas, el buen ambiente y ser transportados a un mundo de relajación y lujo. Sólo cinco minutos del aeropuerto ya diez minutos de la histórica ciudad vieja. Disfrute de excelentes restaurantes, visitas, museos y una vida nocturna envidiable. Inicio de la Premio Nobel de Literatura Gabriel García Márquez, visitar una de las ciudades más antiguas de América. Cartagena fue fundada en 1533 y ha sido designada Patrimonio de la Humanidad por la UNESCO. Tres dormitorios y tres baños con todo lo que usted pueda imaginar o necesitar para unas excelentes vacaciones. El edificio cuenta con dos piscinas, un gimnasio, a pocos pasos de la playa y aparcamiento subterráneo privado. Ama de llaves Exclussive con habilidades culinarias sorprendentes (desayuno y almuerzo), se hará cargo de todas sus necesidades de limpieza y lavado. I stayed with 2 other friends in this wonderful apartment for a 4 day getaway. The apartment was more beautiful than in the pictures, the security and staff at the condo was incredibly friendly, and the lady that was the maid/cook/everything you need, was awesome. Her name was Mayo, and she cooked us breakfast every morning. I would go down to the beach for a morning swim and when I returned a wonderful breakfast banquet awaited fro my friends and I. The owner of the condo called us the day of the arrival to make sure everything was in place and we were happy. He offered recommendations and even reservations for some high end restaurants in Cartagena. We've stayed all over the world in over 20 different apartments and houses and this was by far our best overall experience. An appartment in the probably best location in La Boquilla, with a fantastic view on the beach, a wonderful swimming pool with bath for children and adults, and direct access to the beach. Moreover the flat is very spacious with 3 bedrooms and a very comfortable living area and very well equipped. We were 2 families with 4 children (2 teens). And this was an excellent choice to relax and to visit Carthagena. Very friendly help from the owner when we had a problem. 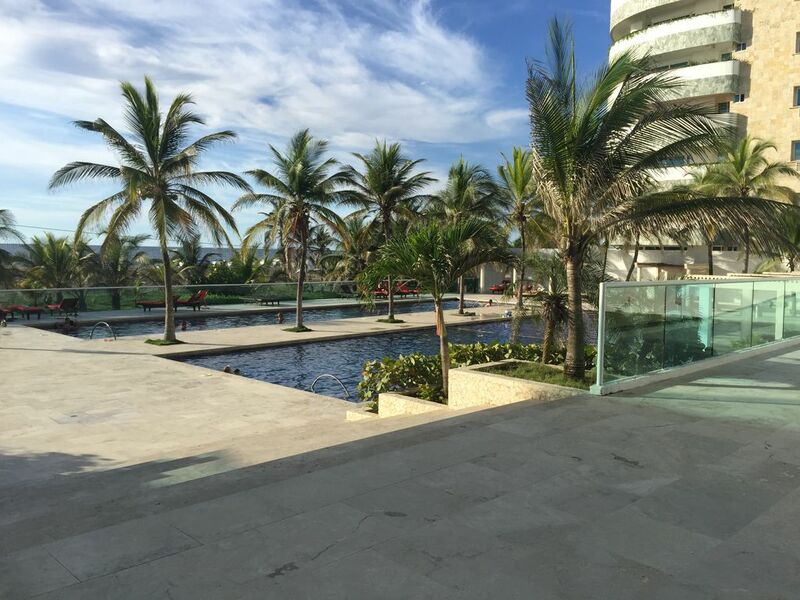 We recently spent a week at this fantastic condo on beach in Cartagena. It was perfect for our family of 5 including two teenagers (yes, there is wifi and it works!). The rooms and living area are spacious, the kitchen is just what you'll need for a vacation (cook included! ), and the balcony has amazing views of the beach and bright city to the south. The facility also has two pools and small market with good, but small, selection of sundries and food. Mayo is a wonderful cook who also kept the condo in excellent shape...she also helped with laundry which was a bonus. Highly recommended. We plan to return again. Terrific option for those with large families. Only a short cab ride from the walled city, this condo is a great home base and has a fantastic view. Highly recommended. Mayo is a wonderful cook. Owner was very attentive for any issues that may come up. We just spent a week in this beautiful apartment. The apartment is spacious and very nicely furnished. There were six of us (5 adults and a child) and we never felt like we were on top of each other. The views are amazing and the balcony was a great place to relax at night. The most amazing part was having Mayo there, she took care of all of our needs, she cooked us an amazing breakfast everyday and two amazing dinners. We would recommend this place to anyone. Cerca del hotel Las Américas en la parte norte de la ciudad.